There were no reason to stop the quest for complexity with Complete Chess. This variant of Shatranj was even bigger with a 11x10 board. 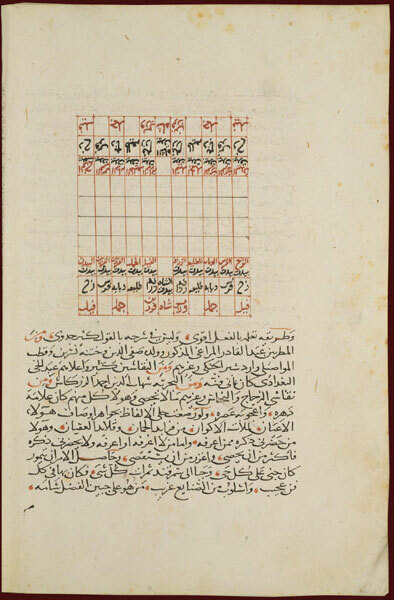 The first mention is from about 1350 in al-Âmulî's Treasury of the Sciences. 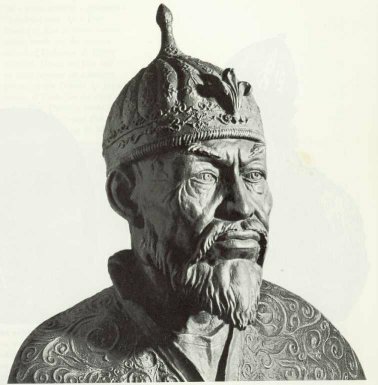 A little bit later, Timur (or Tamerlane) (1336-1405) was seizing the power in Asia. According to his biograph Ibn ‘Arabshâh (d.1450), he loved to play Chess and, precisely, he preferred to play Shatranj al-kabîr, "great Chess", rather than Shatranj ash-shaghîr, the ordinary "small" Chess. 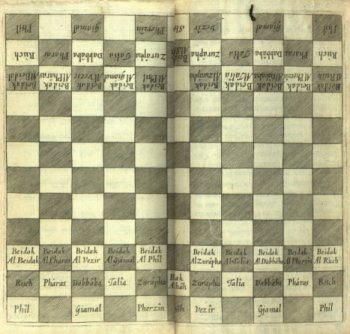 This large Chess variant is rather known and popular, probably because the English linguist Duncan Forbes showed a strong enthusiasm for it in his book, History of Chess (1860) with about 30 pages of description! Our knowledge of rules comes from the translation of a Persian manuscript attributed to Hâjjî Khalîfa (d.1658) but whose original author may be ‘Ali ash-Shatranji, a famous Chess champion at Timur's court. The board has usually 112 squares : 10 lines x 11 columns with one "citadel" square in both sides. (On some historical diagrams, the board may have 11 or 12 lines. Sometimes, the citadels are omitted). Every player has 28 pieces: 1 Shah, 1 Minister (Ferz), 1 Vizir (Wazîr), 2 Giraffes (Zurâfa) , 2 Vanguards or Scouts (Talî'a), 2 Horses, 2 "Rukhs", 2 "Dabbâbas", 2 Camels (Jamal) , 2 Elephants and 11 Pawns. Pawns are all different: they were miniature reproduction of one given major piece. Pawn of Giraffes, Pawn of Vanguards, Pawn of Horses, Pawn of Rukhs. Several starting positions are known. The English orientalist Nathaniel Bland (1850) used to report two. Manuscripts from ‘Arabshâh show a third position. The copy held at BNF (Paris), dated 1451, shows it on a board without citadels! Thomas Hyde gave a similar array but a different illustration on his Mandragorias seu Historia Shahiludii published in 1689. Here, the board has 12 lines! In addition, some other manuscripts show a variant where all vacant squares have been filled with new pieces. 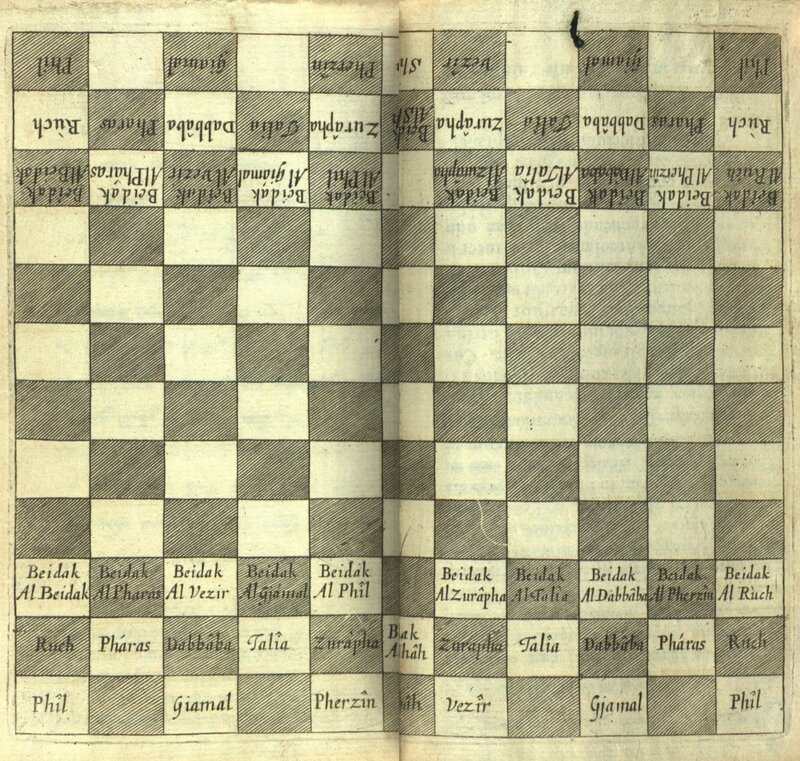 This "full Tamerlane Chess" is presented on a dedicated page. Shah: moves like in Shatranj, or like the King in Chess (although, no castling): 1 step in all 8 directions. Minister: moves like in Shatranj, 1 step diagonally. Vizir: moves 1 adjacent step (4 "orthogonal" directions: front, back, left, right). Rukh: moves like in Shatranj, or like the Rook in Chess (although, no castling): any square along the file or the rank on which it stands. Horse: moves like in Shatranj, or like the Knight in Chess: jumps making 1 orthogonal step followed by 1 diagonal step. Dabbâba: jumps to the 2nd square orthogonally (i.e. along lines or columns). Scout or Vanguard: moves almost like the Bishop in Chess: any square along a diagonal on which it stands. However, there is a big difference: it can not go on the first square which must always be free and skipped. Camel: jumps making 2 orthogonal steps followed by 1 diagonal step. Giraffe: moves 1 square diagonally followed by 3 or more orthogonal steps horizontally or vertically. As it cannot jump, this order is very important. Every Pawn get promoted to the piece that it represents when reaching the last row. The Pawn of Shah is promoted to a Prince (Shâhzâda) and then, moves like a Shah, except that it may be captured. when reaching the last row, it gets immobilized and can not be taken. At any moment, it may be lifted and placed on a square from which it can attack a piece which can not escape, or from which it can fork two pieces. Therefore, one can then capture an important piece that way (it is assumed that this piece must not be a Shah). when reaching the last row for the second time, it is lifted up and placed on the starting square of the Pawn of Shah. when reaching the last row for the third time, it become an "adventice" King (Shâh masnû‘a) who, like the Prince, moves like a Shah but can be taken. Citadels: only the Shah is allowed to penetrate the opposing citadel. By doing this, one can ask for a draw game, or can exchange the places of Shah with Prince or Adventice if the player possesses one of these. No piece can penetrate its own citadel except the Adventice. In such a case, a player prevent his opponent to bring his Shah there and obtain a draw. Shah's evasion: once in the game, a Shah in check or mate or stalemate, can exchange his position with any piece from his side. Victory: the final goal is he capture of the opposing Shah by mate or stalemate, after the possibility of Shah's evasion has been exercised. Baring the opposing Shah is not a victory here: that Shah can continue to play. H.J.R.Murray, "A History of Chess", Oxford, 1913. Duncan Forbes, History Of Chess, London, Allen, 1860, reprint Publishing House Moravian Chess, CAISSA-90, ISBN 80-7189-556-3. (Remark: despite Forbes' book has been completely surpassed by Murray's on many aspects, it is very intersting here because of the very deep study made for Tamerlane Chess. Apparently, Forbes was enthusiast about this game).